Q is for Quilt One Done! Here is what started me on this art journey: the elusive art quilt. I’ve made quilts from patterns before, and even modified existing patterns and did my own thing from there, but I’d never started with an idea and tried to turn it into a 9 x 12″ finished piece…until this. 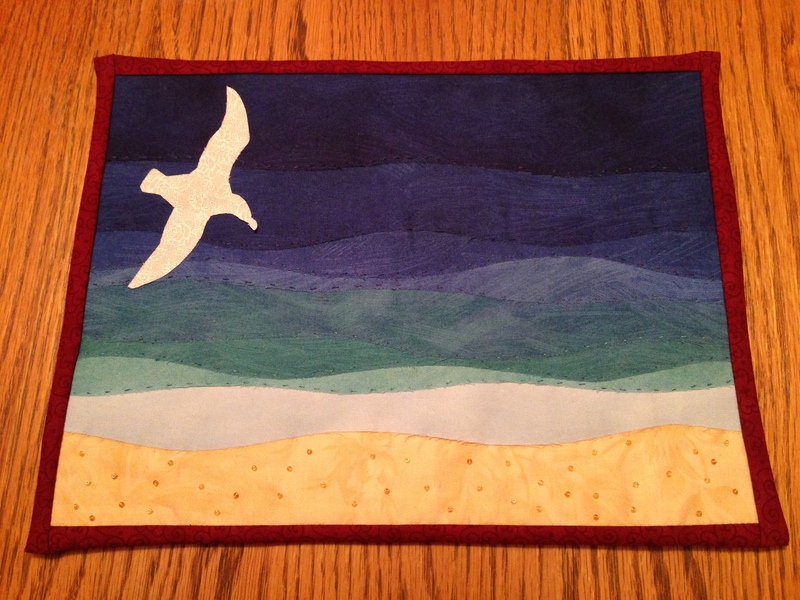 This is the first of a series of three quilts that, when hung together, will show the seagull in flight, soaring high above the ocean. It’s the first of a series on the freedom theme. I hope to have the other two finished tomorrow, but I’m very excited to have completed one. The great thing about art quilts and mixed media is that the sky really is the limit. I have been a quilter for over twenty years, and during that time, I’ve collected lots of fabric. Much of the fabric I have I no longer like, but when I really get into this medium more, I plan to paint, ink, watercolor, you name it over my existing fabric until it works for my piece. I would really like to open an Etsy shop after busy season is over and go to town producing these for sale. I could work from a theme, a color (or range of colors), a mood, a season, the possibilities are endless. I’ve even thought about making an art quilt to accompany a poem that I wrote, or making something that gives me the feeling I get from reading a favorite poem. What do you all think? I think what I like best about this part of the journey is that, with so much fabric, thread, beads, etc. already…there is no limit to what I can make. My (lack of) drawing skill used to hold me back, but now that I’m drawing every day, I was able to freehand that bird motif from a photograph in just a few minutes. I just had to share this with you, and how serendipitous (woo, I think I spelled that right, I see no red underline lol) that the letter Q was next up on the day I got this finished! I hope all of you are enjoying the holiday weekend, and that you’re planning to feed your soul today. It’s time to make yourself priority one. Right? It’s Sunday. Sundays are the best. Tomorrow, I’m doing another bird by request. Hope to see you then. Love this! Congrats on finishing a piece like this. I have dreams of doing so, but never quite get there. Hope to see you on Etsy in the near future! Thank you, and I hope you turn your vision into a finished product too! This one was six months from vision to what you see. Hoping now the first is done, the rest will be faster. I’m so glad you like it! Thanks, T! I’m so glad you enjoy it too. This art quilt has taken me on quite a journey. Freedom, indeed! I like the way the blues work. Thank you. I was lucky to have one piece of fabric with all of those beautiful shades. So many wonderful talents you have! Beautiful! Can’t wait to see the rest. Thanks! Hopefully today, fingers crossed. Love it. Looks great for the beach. Nice job. So beautiful. And I love that drawing helped your skills in a completely different media. It just goes to show: everything leads back to drawing. Thank you! It is so true. I thought I could skip past it, but alas, it kept paging me until I couldn’t make the beeping stop lol. Man, so am I. Imagine the number of people out there like me who always said “I can’t draw.” What’s the deal? I guess we have to give ourselves permission to do something so fun and frivolous (esp. as women)? I feel like my whole world has opened up. It’s amazing. All because I decided to really go for it and just work at it. It helps to have a burning passion for it too, not sure where that came from, but since it’s been around since August, I figure it’s here to stay! Anyway, thanks for your comments, suggestions and support. Beautiful, I love it. Yes Etsy!